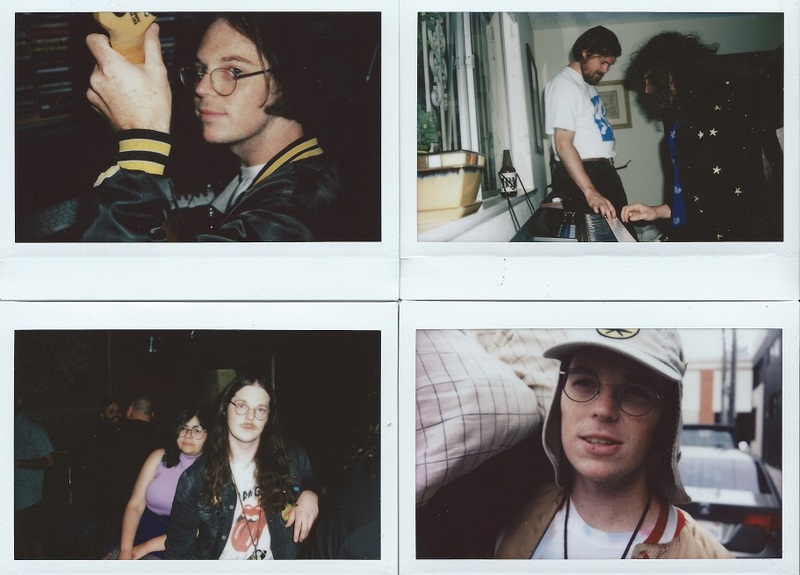 The real cool world of pop wizards Emotional; polyptych Polaroid photos courtesy of Colin Arlen. Yumi Zouma live at Baby’s All Right; photographed by Sam Leung. It was as though there was a brief pause in all of our lives and we finally felt like a band from New Zealand. We were on home turf and creating from a place that felt fundamentally natural. New Zealand has a distinct feel from Christmas to the end of January. Things shut down. It has a calming presence, it’s very peaceful. Squadda B was sighted on the FITH produced track titled “And I Swear” that features the North Oakland rolling & relaxing studio style with a pensive delivery & presence. With a super understated atmosphere & glowing organ tone; Squadda’s reiterations of “you bring me up” finds the iconic artist stopping to smell the flowers to expanding his own lesser-stated introspective side (that has always been there, and has only grown in terms of sophistication). Thatshymn dropped the new soothing track “Therapy” that features production from saidbysed that sparkles with a hedonistic air & flair. The track dabbles in all the indulges that expendable income allows as Thatshymn pontificates on how good that good life can be. Pageants dropped the electro-charged single “Chai ( חַי)” featured off the upcoming debut album Forever available at the end of October via Eye•Dull Records. Comprised of Avi Buffalo founding member Rebecca Coleman with bf Devin O’Brien and assists from friends Cherry Glazerr & Best Coast’s Dylan Wood; Coleman is crafting wonders never before witnessed in AB where intuition & innovation returns to rustic roots that make for more expansive & entrancing musical visions. UK noise lords SPC ECO returned to bring the utter delights of dissonance with the new album song collection called Calm. Tapping into all the dream weapons at their disposal, Dean Garcia (of Curve fame), Rose Berlin & Jarek Leskiewicz present their latest sonic incarnation manufactured between this past January through August at The ELaB. The result is a weather-making-machine of SPC ECO’s own invention where they invite the listener to take the trip with them through songs like “Out of Sight”, through the celestial chorus calls heard on “All The Voices”, where the industrial dream machine overdrive kicks in on “Waking Up Again”, the driven & pensive “Rising Up”, the hand in hand held grasps of “All I Had”, right as you are gently led to the sonic slipstream of “Pearls”. Questions of identity & the shifting time chronicles of change are mulled over in “Who Are You Now?”, where those echoing inquiries take a walk on the mysterious & eerie side with “Ghosts”, the sinewy seduction of “When It Moves”, before moving deeper into the depths of the woods with “Get Lost”, to the inter-dimensional edges of “Over”, right before crossing over & into the closing benediction of “Hours” that leave you with ambient electronic audio fields to focus on even after the music has ceased its spin. Big Band, lead by Chris D’allesando, brings us the restless rocker “Itch” featured off the forthcoming album Options. Recorded with Connor Hanwick (formerly of The Drums), Big Band brings about a real big brash sound with a might & howl to bring down the biggest of clouds & might even cause the clusters of space junk to hurdle their way toward earth. Australian duo Chymes provided their rendering of the Jon Bellion track “All Time Low” that offers up some subtle electronic reinforcement to help those areas of life’s low tide feel a little bit better. The duo’s harmonies are expressed in understated expressions that allows all implied feeling to find a natural place of being & belonging alike. Introducing French artist Losange who makes music that resembles old vintage MIDI processors from old school 90s PC sound cards & other vintage electro tech devices. Presenting a listen to “Feu Endormi” featured off the debut album Quartz available September 22 through Johnkôôl Records; the sound of a long lost computer game challenge is fast forwarded from the past to the immediate pertinent & present of now. More beguiling pop from Un Blonde as we bask in the sublime & surreal harmonic meditative-majesty that is “The Real Way (Reprise)” featured off the upcoming album Good Will Come to You available September 22 through Flemish Eye Records. The Montreal artist utilizes a mantra percussion & strum style to amplify the tonal expression exhibition of the reeeeeeeaaaaaal waaaaaaay that are guaranteed to take you way out into a dimension of the real that you have never before experienced. Western Scene provided a look at their lyric video for “Going Back”. From the creative mind of LA artist Tom Pritchard & featured off the forthcoming follow-up to 2013’s Listening available later this fall; the Emily Wilder visuals for “Going Back” gathers together an assortment of Google Street View perspectives that gives the viewer/listener a feel of freewheeling throughout the highways & freeways of lifes multitude of collective corridors. Nashville artist Becca Richardson delivered the evocative, urgent request for actualized immediacy via the single “Right Now” featured off the upcoming album We Are Gathered Here available October 6. Questions of controlling passionate feelings that run wild during intense connections (both making up & breaking up) are exhibited in those wishes to control the wants & desires of the heart. LA artist Janessa Evrist brught us out to the outdoors of the unknown from abandoned springs & illuminated caverns featured in the visuals for “Show Me Something”. The search for something greater, brighter & more meaningful is Evrist’s quest for something real that can be witnessed & experienced as something that exists beyond the imagination of fleeting ephemera. Austin, TX’s Black Pistol Fire are readying their new album Deadbeat Graffiti for release September 29 & they offered up some derelict directions & more on the scuzz-stravaganza of “Lost Cause”. This is the jam for all desperadoes & exiles to find a slice of home & feeling of abode in a ballad for all drifters slipping through a litany of one-horse towns—hopping through & stopping by one municipality province after the next. Kick back & enjoy the Statik Selektah remix of Brady Watt’s “Roots Around My Ribcage” ft. Clifflight that exhibits the composite pieces that comprise the entirety of our beings. Everything from identity to intimate expressions are given a visceral back beat to the heart of Watt, who is part of DJ Premier’s own group called The Badder Band. The Roseline offered a little heart on the gentle affections of “How to be Kind” featured off their new album Blood available October 6. Classic arrangements & productions point toward piano & percussion lead progressions that offers a lesson on the importance of being kind & other simpatico behaviors. GERMANS’ brought all the atmospheric everythings with the single “Little Red” feat. Lowpines that feels like something out of a certain legendary Lynchian franchise. A feeling that oscillates between inexplicable events & evening audio essences are further accentuated via Lowpines’ delivery that feels like a journey through roadhouses that exist at the end of lost highways & at the foot of an infinite forest. Felix Hagan & The Family delivered the eccentric rocker “Hey I Want You” that is fit to be featured into an eccentric stage set musical. Featured off their debut album Attention Seeker available November 20; this is the track that will rekindle all your high school play/musical memories as if those misspent moments were but a fortnight ago. NYC’s Ben Phipps dropped the new club-cast electric jam “Mrs Mr” ft. Lizzy Land that is crafted to shine some lights to your infinite nights of seemingly endless & elusive pursuits. UK’s The Duke Spirit delivered the vintage international dance-a-thon visuals for the moody “Houses” featured off the album Sky Is Mine available via Ex Voto Records. The sound & feeling of music made for dance-parties right in the comfort of your own abode/home/apartment/castle/dorm/etc arrives like a kinetic cloud of pop whirling wonders. Diamond Thug readies their debut EP recorded with an assist from Dave Minehan (who you might know from The Replacements) & presenting a listen to “Cosmic Dreamer” that sends out bottle rockets of imagination upwards towards the perceived infinity of the heaven’s vast & expanses up into the unknown. Through chords that draw in the listener like the most fantastical of dreams & visions of new days/nights; “Cosmic Dreamer” might take you back to those familiar places that were once visited previously before while nestled into the safe arms of sleep. Manzanita Falls offered up their potent labor of blood, sweat, tears & beers with the mystic & mysterious album Abilene. Expressions & exchanges recalled rage like angered skies on “To Be Fair”, the heart-wrenching “Dead Alive”, to the isolated atmospheres of “Weatherman” & the pained “Write Home”. Fallouts in the fog transpire on the lonely hearted cold stroll of “Talk Is Cheap”, carrying over into the margins of “Between the Stories”, the confrontations of “Strangers”, the long ride home of “Matt Drives at Night”, right before bringing down the bow down with the last-call crasher of the title track. Abilene is a personal & often painful experience you won’t soon forget to the archives of memory bank libraries. Norway trio Great News lives up to their appointed moniker by sharing the free-soaring title track single feature off their forthcoming debut album, Wonderfault. The sentiment of catching air like being lifted up by the string of a high-powered helium-heavy balloon toward new discovered stratospheres. Turn the auto-tune up with Miquela & the lyric video for “Not Mine”. Notes on possessions & all the nuances that occur between falling both in & out of love are expressed in a restrained electric pop discourse that revolves around being choosy. Also check out Miquela’s new super-electro-fied jam “Over You” that basks in all the maximalist pop tropes while maintaining an air of sleekly produced serenity. Samantha Urbani presented the arty & snazzy niel J.Algarin & Taylor Harris video for “Hints & Implications” featured off the debut EP Policies of Power. The visuals cater to the electro undercurrents & over-currents of Urbani’s new, new-romantic/cosmic approach to ultra-pop concepts. Nashville’s own Year of October delivered some rugged road rolling rock with their single “Come & Get It” featured off their upcoming third album Trouble Comes available in October. The married duo of Phlecia & Josh Sullivan follow up Golden Days with a tune tailored out of dives from dusty gulches with a penchant for pub pop met with that big city sort of swagger. Deradoorian brought the zen with “Mountainside” featured off the forthcoming mini-album Eternal Recurrence available October 6 from Anticon. Cathedral-like acoustics reverberate in ways that fill the listener’s consciousness with the feeling of walking through a hallowed hall of cryptic mysteries & elaborate abodes that house antique systems of self/populace governance. LA’s own A Million Machines offered up an electronic view/preview of their upcoming single & visual for “Come Tonight” slated for September 22 where deep synth expressions are met with an overwhelming sense of electric lights & more. Oakland’s own Labyrinth Lounge provided a listen to the classic meets contemporary pop sound spectacle that is Porgy available via NYC’s Rufftone Records this forthcoming September 8. Updating schools of Gershwin standards that are pointed toward new expressions that have yet to be titled; the East Bay artist blends a narrative between “Trouble Won’t Last” & “Displacement” that brings timeless tribulations to the current day trials of challenges our ancestry could not even begin to imagine. Jersey’s Hodera took us along the rustic & rural trails telling heart-felt tales with “North Dakota”, featured off their forthcoming album First Things First available October 20. With word of a fall tour beginning in NYC at the Mercury Lounge on October 31; the group amplifies sentiments via rustic pop channels that are ready for the circuits of radio & stages galore. Vessels delivered a listen to the electric lit single “Deeper In A Sky” ft. Harkin found off the forthcoming The Great Distraction available September 29 through Different Recordings. The Leeds band has been busy lately working with Flaming Lips’ Wayne Coyne, John Grant, Djang Django’s Vincent Neff & Harkin, formerly of Sky Larkin, Katie Harkin to create a fully immersive experience where all the electro pop energy is shuttled for those places beyond the immediate reach of the sky above. Welsh group Seazoo brought the new seaside jangly feels with “Shoreline” featured off their November slated album debut. Word has it their full-length was recorded in a decommissioned nuclear bunker in the hillside of Islet at Pontvane Studio & their Wrexham home with an assist from Big Jelly’s Mike Collins; sincere songs of land & oceanic intimations collect like the congress of two formerly foreign bodies. Evalyn + Evalyn dropped the Marky Style & Guy Gabriel’s remix amp-up of their new track “Cherry Lambo” with word of their debut EP Sandcastle available in October​​​​​. This is the track to help make that summer to autumn transition a feel a little less harsh​ with wishes of unrelenting awesomeness. Violet offered the world an advance listen to their upcoming debut single “Feel” available September 15 through HolyHowl that will trigger all of your latent 90s obsessions & affections to the surface of your consciousness. Bust out your old issues of The Face & Sassy as nostalgia for long hair days of brash & bold styles kick those overused 80s aesthetics to the sidelines for the messed-up romantics to sort out. Ben Stevenson offered some hazy warmth & reassurances with the new single “No Better Way” that embraces the essences of the best moments & methodologies featured off Cara Cara available September 22 by way of Culvert Music. Classic meets contemporary feelings where vintage surface noise crackles allude toward the bright beam fall of rays from the most inexplicably wonderful instances that defy conventional expression.